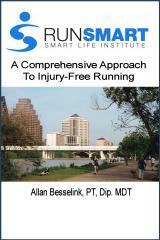 Welcome to the official book release party for "RunSmart: A Comprehensive Approach To Injury-Free Running" - live from Austin, Texas at 7:00 pm central time. The live videostream should begin at approximately 7:15 pm central time with introductions and some words from the author, Allan Besselink, PT, Dip.MDT - Director of Smart Sport International and the Smart Life Institute. For those who weren't able to make it, here it is!! The Smart Life Institute network feed can also be found at www.ustream.tv/channel/smart-life-institute.